Sorry, this offer is no longer available. Check out other freebies you can request and be sure to subscribe to Northern Cheapskate for more money-saving tips! 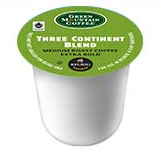 Get a free sample of Green Mountain Coffee K-Cups on Facebook. Just click on the “Get a Sample” option from the menu and watch a 30-second video with Kelly Clarkson on her experience with Fair Trade coffee. These won’t last long so get yours now! Thanks goes to Freebies 4 Mom for sharing this free coffee sampler.